The story of Boca do Lobo is unique, exclusive and extraordinary behind the creation of beautiful objects. They strive to encourage sensational experiences by creating beautiful pieces which are passionately inspired and handcrafted in Portugal by a staff that loves what they do; experiences which pass on the feeling of exclusivity. Their designers possess an undeniable talent for composing pieces which stir emotion in their admirers. 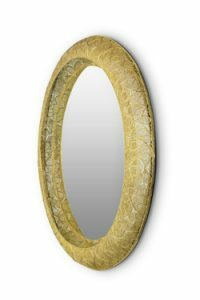 The large wall mirror’s edge is made of brass cords gilded in 18k gold, conceiving an exquisite gold round frame which elevates any setting into world-class interiors. The richness of Filigree Ring lies within its detailed jewelry expression in which skilled artisans painstakingly solder tiny beads and twisted threads to create striking artistic motifs. A precious piece of art that pays tribute to the finest craftsmanship, ideal for a unique and exclusive home. The art of filigree was born during Roman period and it was passed down through the generations of skilled medieval jewelers, often emulating the work of the Byzantine goldsmiths of Constantinople, embellished crosses, reliquaries and the covers of bibles. Later, the filigree became very popular in the French fashion world from the 60’s until today. And actually, countries such as India, Italy, and of course, Portugal, have been treasuring it. Deeply embedded in Portugal’s history and culture, there are countless brilliant examples of this remarkable handmade technique. As expected, the Trump Brand is highly demanding and requests the best of details, quality, and perfection. Thus, Lodha Group and HBA Singapore were opted to face this challenge and along with Boca do Lobo, they have unified their powers into a spectacular outcome. All the design pieces were genuinely selected and positioned inside this spectacular Lobby that seems like an infinite ocean with multiple beautiful, soft details. From the blue palette carpet with the beautifully random edges to the delicate cushions and the high design armchairs decorated with an amazing palette of blue and light ocean hues. This living space functions as a magnet to all the design lovers and professionals. 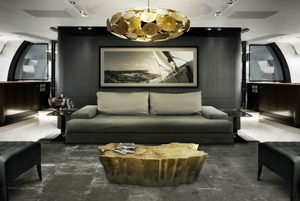 In this ambiance, standing out with its imposing presence and the elegant style, the Lapiaz Oval center table looks like a result of karst formations produced by surface dissolution of limestone or dolomite rocks that are freshly cracked and about to show to the entire world a rich, diffusion of gold. Considered to be a statement piece of art, the Trump Organization was more than excited with this choice. Aiming to be worthy of the expectations of the great organization, the polished brass details and mirrored sides attribute this design artwork that expresses a comfy and warm beauty. Also, the polished stainless steel on the exterior and the gold leaf gliding shine brightly at the sumptuous style of the living space, making it a statement piece for the most luxurious interior designs. On the concept of keeping the sequel of the building construction of the Trump Organization alive, Mumbai’s new acquisition is here to prove that design is revolution and inspiration. The Lapiaz, French word for stone, when friezed it cracks into an unexpected beautiful interior is revealed. Like this unique stone, Lapiaz also mesmerizes the world of design with a surprising golden treasure hidden in each detail. A limestone pavement is a natural karst landform consisting of a flat, incised surface of exposed limestone that resembles a floor sculpture. The reinterpretation of the past with a contemporary touch is part of the core values and aesthetic of Boca do Lobo, combining good design with exceptional production skills. The richness and variety of our cultural heritage with centuries of history, the portuguese legacy couldn’t be more fertile to our designer’s inspiration. Altamount Residence is one of the design projects from HBA, Hirsch Bedner Associates, and one of the most iconic design concepts from this is the Eden Center Table designed by Boca do Lobo. Hirsch Bedner Associates is an international hospitality design firm that has been leading the hotel design industry and is renowned to be the biggest design firm in the world. The one that can identify trends and predict new directions and innovations. 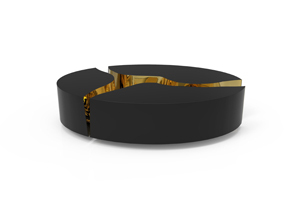 Familiar with Boca do Lobo’s name the design firm stepped up its game with one of the bestseller pieces from the luxury brand, designed and crafted with passion, Eden Gold Center Table. This residence was inspired by the multi-layered urbanity and culture of Mumbai, so the living room turned out to be the most pleasuring place in the residence to enjoy the city’s aesthetic from both the inside and outside. It gives the sensation of being on top of the world while being captivated by the breath-taking landscape and design. The room’s midnight blue chairs perfectly match with the hues of the early night sky and the furniture’s delicate light tones, joined by the gold elements of the Eden piece soften the place becoming a pleasing harmony. Honouring the craftsmanship in an outstanding way, Eden, a Boca do Lobo’s bestseller piece turns into the shaft of beauty in the middle of the residence’s living room. Influenced by trees and flora, and just like trees grow with singular shapes and exquisite textures, each piece is uniquely crafted and transmit exclusive feelings. This luxuriant place full of pure desire gives purpose to the Eden Family, a piece where it can be found the pleasure to have the most exclusive feelings and possess the unknown. In the middle of this luminous and spacious living area and surrounded by vivid-coloured details, Eden Center Table set turned out to be the mystic and magic history to wonder about. Throughout several manual processes by an experienced team of craftsmen, polished casted brass is thoroughly worked until life to Eden is given, leaving it with a mark of its identity on the surface, a delicate print of its inside. Going to the next room of the residence, adorned by marble from the bottom to the top, the kitchen radiates a speckles and graceful ambiance. Giving up the blue, grey and gold palette, sometimes simplicity is the key to add richness and this room’s design is the perfect demonstration of that. Entering the bedroom, the wish for an open bright space is noticeable and it was assuredly granted. Matching the light that radiates through the windows, the design also lights up the entire division. There is beauty in simplicity, and its grey and white reveal the purest form of beauty of design. Surprising with a yellow and green splash to wrap everything together, the entire room gives a pleasurable warm welcome. The whole picture makes the viewer feel glamour and luxury, and no matter how small, the attention to detail and the stunning accessory selection became essentials for the designer for this layered experience to be felt even on the extraordinary bathroom aesthetic right through every golden corner. Altamount Residence explored the design and went creatively further. Boca do Lobo once again accepted the challenge to have its piece featured, and Eden stepped inside this project and turned out to be a great luxurious statement piece which genuinely became the pot of gold at the end of the rainbow for this design. Known as the Paradise, the Garden of Eden gives life to pleasure and exclusive emotions of human life. A divine place where life begins and trees grow with singular shapes and exquisite textures. This is the Eden’s Series never told story. This luxuriant place full of pure desire gives purpose to Eden Series. A Garden where it can be found the pleasure to have the most exclusive feelings and possess the unknown. Surrounded by beautiful and unique trees each one with different meaning the Garden turned out to be a mystic and magic history to tell. All the details in Eden Series represent a trace of certain kind of Eden’s tree. Dedicated lines and bold details inspired the concept of this piece of art and the design world nowadays. Different shapes and finishes compose the Eden Series, a Boca do Lobo’s best seller designed with passion. Fully made of polished casted brass, with a delicately engraved top exposing the heart of a golden tree to the very heart of a home.